Our friend Robin, of Streaked Mountain Herbs and Crafts, made a delicious batch of raspberry maple syrup this year which she shared with us this holiday season. This product would also work wonderfully as a glaze for grilled chicken or pork, or it could be used to top cheesecake, flummery, bread pudding, or any other not-too-sweet dessert. 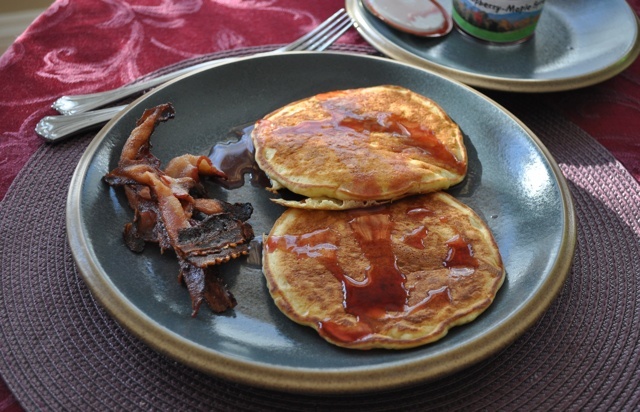 This entry was posted in From the Garden, Made in Maine and tagged buttermilk pancakes, raspberry maple syrup, Streaked Mountain Herbs and Crafts. Bookmark the permalink.